This interview was conducted by Juan J. Trevino on March 20, 2007 in San Antonio, TX. as part of Palo Alto College’s History 1302 – Spring 2007 class. Juan Trevino Jr. was born on May 23, 1949 to his parents Juan V. Trevino and Trinedad R. Trevino and was one of four siblings. He was born in San Antonio, Texas and received his high school diploma from Edgewood High School and recieved some college from San Antonio College. When he was 18 he joined the Air Force because of the draft. With that he was stationed in Rantoul, Illinois; Austin, Texas; South Vietnam, Langley AFB Virginia, Tacoma, Washington; Kunsan Korea, and Sumter, South Carolina. Before he joined the military he worked at the Gunter Hotel as a hall boy. He married my mom, Lydia L. Enriquez Trevino, when he came back from Vietnam, on October 2, 1971. Together they had four children in order, Belinda Trevino, Leticia Ann Trevino De La Cruz, Cynthia Trevino, and Juan Jesus Trevino. Juan is a middle class, conservative Republican, catholic and is now retired USAF Enlisted. He now works at Randolph AFB doing what he did in the Air Force, an aircraft technician. His hobbies include: fishing, coin collecting, and playing guitar. He is my father and I am his only son. What was it like growing up in San Antonio as a young boy and what did you do for fun? Growing up in San Antonio as a young boy would be as about the same as now but things were done a little bit diffrent because there was very little T.V. compared to today. Going to school and making sure that my homework was done, my parents always made sure that we set enough time every day to go over our homework and they would check it after we were done or we would ask question if we had problems that we couldn’t figure out. As far as having fun, during the weekends we use to visit our relatives and I use to play with my cousins. We use to do all kinds of activities, like make believing that we were camping, hunting or fishing. I guess we would imagine a lot of stuff that we would do in our backyard because we couldn’t be out on the parks, lakes or rivers. So we managed to create our own fun and it seems like those days were a long time ago. Before entering the Air Force, what was your knowlege of the Vietnam War? During high school and before I joined the service I saw a lot of T.V. were a lot of Americans everyday were killed. What I knew about the Vietnam War was that the country wanted to be free from communism and the United States was asked to help the people from South Vietnam to develop their own free country. I think the war was just a fight. I knew inevitably that I would have to do my duty and be there during the time that I was in the Air Force. How come you volunteered to go into the Air Force, instead of letting the Draft decide? I volunteered because my father was a civil service employee and he spent four years in the army during War World II he saw the diffrence in the services working at Kelly AFB. When he worked around Airman Sergeants and officers he told that, that was the best service to join and it was better then the other services. So I listened to my father and decided that I did not want the Draft Board to decide weather I should be enlisted into the Army or the Marines. My dad also told me that I had a better opportunity for skills that I can train on and hopefully benifit me after my service duty. When you entered basic training, were you ready to go into action or were you scared? When I entered basic training I was a little scared just like everyone I guess but not to the point to where I would try to do anything I could to stay out of it. Its one of those things that everyone is a little scared. Its not going to interfere with what you have to do, you just have to go in there with a positive mind and do the best you can to show what you can do to learn as much as you can and to get through the six week traning here at Lackland. When I notice that everybody was a little scared, everybody was just like I was, I felt a little better because I knew that I could get through it and just like anything else you get close to graduating and you get use to your surroundings. You get use to your Technical Instructors (T.I.) they become apart of your family, you listen to them you obey what they want you to do and they’re in there to guide you through the whole process until you graduate and go to your next station. What was basic training like and what did you have to go through? Basic training was a little bit of everything. School work, classroom work, classroom instruction on military education. Also had time set aside for drills, marching, for learning your commands, different type of techniques. It also should me about military and Air Force history, how we evolved, what we got to, where we are at right now. It showed me the different type of uniforms, how to properly wear them, how to recognize the different ranks, how to recognize officers, how to talk to fellow airman, sergeants, and officers. It has some obstacle course, lot of first aid. It was not just what I thought it was going to be, a lot of exercising, army maneuvers, they didn’t have any of that. SO after the first couple of weeks when we got use to not being around our families, our environment you kind of put everything out of your mind, and just concentrate on getting through everyday. It was something else and I think just about anybody can do it if they put their mind to it. I was leery at first but I saw that everybody was in the same boat I was, it got a little easier till I got through. I recommended that for anybody it shows you a little of discipline and you see the world in a different way then before. You learn to recognize and appreciate the freedoms we have that we take for granted and to see what was done by a lot of military people, to have what we have. What was it first like when you entered Vietnam and was it anything you expected? No it was not all what I expected, what I expected was from watching T.V., listening to friends that had friends that were in Vietnam. 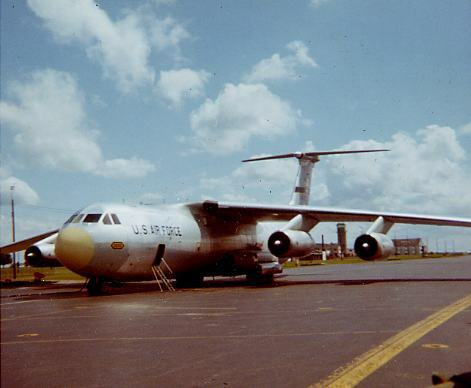 When I first got to Vietnam War we landed at Denang AFB from Hawaii. It was a vary mountainous area there was a lot of clouds in the sky, tropical type of weather. I recollect flying in a circular path on top of the runway until we got low enough to drop out of the clouds and see land. I found the reason why later we were trying to avoid flying low over I guess insecure areas and when I first got there it was looking around the base and everybody that I saw they were in the military air force, army, marines, and even Navy people on that base. It was a tropical type of land, rained a lot, very muggy, lot of mosquitos. We weren’t allowed to go off base so I did not get to see a lot of the land that I guess being in the army they would go and patrol and so forth, we didn’t have none of that, we were Air Force people and our primary job was to repair the F4’s that were stationed on that air field and to keep the flying keep them able to do the job that they’re there for. I was a aircraft mechanic basically and my life consisted of living in a compound, old time barracks. Of course what you saw around the base around the perimeter a fence was a lot of mountains and I remember that the higher elevated mountains always had a cloud layer. I didn’t see much of the land because we were restricted. Did the thought of being killed ever cross your mind, and how did you deal with such thoughts? The thought of getting killed in Vietnam in war didn’t start in Vietnam it started when I was in elementary. I knew I had to go to war sometime in my life so I guess I was mentally prepared to some extent for that possibility. The way I use to look at it back then is that I just have to show courage and do what I’m suppose to do. There’s a saying that says everybody has to go through something like that in their life and you just hope for the best that you don’t get hurt. You have to keep that thought that courage thats stamina I guess you can call it be mentally prepared and if it comes to pass thats the cards that you are dealt. Thats the best route to take, I never thought of doing everything I could to keep away from that type of danger. I knew I had to face it and being Mexican American I had to prove that we are just as good as anyone else. What was your job in the war and what things did it require you to do? My job in the war was I you can generally say, aircraft mechanic. At that time I was working on F4s, fighter aircraft. That was the most modern fighter aircraft at that time its 1971. My job was to repair the environmentale portion of the aircraft which consisted of the oxygen system on board, pressurization system, temperature control system, boundary leer control for the wings, anti-icing for the engine, anti-icing and defog for the windshield. A little bit of everything that consisted of the environmental portion. I did such things as remove and replace the air conditioner packages on the aircraft, trouble shoot pressurization malfunctions, trouble shoot, remove and replace oxygen system parts that was on the aircraft. In the shops we use to repair the broken parts that we would remove, we use to repair them and make them serviceable and turn them back into supply until they are used again. I worked along with other mechanics such as engine mechanics and hydraulic people. Worked hand in hand with the crew shifts, the ammunition people that loaded the bombs on the aircraft wings, worked with the fuel people, their job is repair all fuel systems on the aircraft. A little bit of everything we were mainly all mechanics, we had a certain specialty so when they required somebody to repair a certain part in the system they would call for a technician that went to school and had a good working knowledge of the system to repair it and get the aircraft back in commission so the pilot can fly it and do the missions that they have to do day and night. What was it like being able to see your brother overseas at war? It was like taking a mini vacation because we had already corresponded through mail that he was going to go do there for a couple of weeks and we had good memories of the period. When he got there he was in the Navy, his uniform was a lot different then mine was, and he was my best friend. You know in a place like that you kind of forget a lot of the boredom and loneliness and just have fun as much as we can with the limitations that we had. He went with another Navy friend and we talked a lot and partied a lot. Back then we were working six days a week, twelve hours a day we had one day off, my day off was a Sunday but I got some breaks during the couple of weeks he was there and my supervisor would let me have a hour here a hour there, something like that because he understood that my brother was there. Most of the time we were there we of coursed talked about the job he was doing the job I was doing. I showed him the aircraft, what I repair, give him a run down, show him the cockpit, and just had a blast. Took a lot of pictures and remember one night we were walking back from his barracks were he was temporarily staying and we could hear gun fire, lot of tracers, lot of what they call lighting up the perimeter. So it didn’t bother us very much after the drinks that we had, its one of those things that we just remember and say, something could have happened but it didn’t. We just had a good time and then he was going back to the Philippines and we wrote back until my tour was done there. What happened that caused you to receive your purple heart? On July the 5th, 1971 at about one o’clock in the morning there was a rocket attack, the sirens went off, it wasn’t the first one, there were a lot of them before, we had already knew what to do, put on your helmet and your flask vest, drop to the floor and say a prayer. I was going to do that, that night when I heard the siren going on but it didn’t let me because I got hit by what they call sharp nail, pieces of metal from the bomb that must have it hit right outside the barracks. What were you thinking when the bomb hit and you were hurt? First thing that goes through anybodys mind is you know your hurt you just dont know how bad your hurt because it takes a while to sink to find out the extent of your injuries. I remember that all the lights went off because it must have knocked off the power and there was a fire started and everything was kind of crazy because everybody didn’t know what was going on. People were running down the hallway, going back and forth, shouting, calling for the medics. Its just one of those deals, I knew I was hurt, I didnt know how bad I was and the only thing I wanted and everyone wanted was to get to the hospital, they had a hospital I guess another building not to far away from where I was at and when they looked at me and I found out there were other people that were also wounded, some got killed. I know the my injuries were not that bad compared to other people injuries so they kind of checked on me and concentrated on the other people that were seriously hurt. They finally made a determination that we were going to be flown out of that little hospital that they had there, and send me to one of the army mash hospitals on top of the surrounding mountains. It was night time, one oclock in the morning so as my head was sticking out of the helicopter I could see the fire down below as we were climbing up in altitude, it must have been a pretty bad rocket attack that must have hit something, most of the previous rocket attacks did not hit any of the barracks but this one did. What was going through your mind when you were in the mash unit? What was it liked when you returned home, and was it awkward? What I learned from doing this interview was the fact that joining the military doesnt always mean that your going to war but that you can actually recieve and education and obtain a good job in the skills that you learn. To me the most important points made in this interview was that basic training could teach a great deal and not take our country for granted. Also what his job required him to do was important to the pilots. They depended on him and the crews that he worked with to keep the F4’s up to date and in working condition. The things that I learned from this interviwee was that, when he was a young boy he use to play make believe fishing, which I remember doing too as a young boy. The feelings the interviewee made where really emotional because he explained how much he was in pain from the bombing and how every one was yelling, crying, and screaming from their injuries. He also stated his opinion about how they should have treated him higher when he reached Wilford Hall hospital. The stories should me what it was like on the bases in Vietnam and what the land was like. This interview should his side of the storie and his experience instead of a texts book’s facts. There was not much to verify the stories that were told but the pictuers he took of him and his brother, the bombing, and the people of the land. The benefits of this knowlede is that I know have a higher respect for my father and what he went through for his country. The drawbacks of this interview was we had to cut back the interview short and I didnt get to ask him all the questions I would have liked. Also I didnt get to do as much because the interview took very long because he paused a great deal to reflect on his memories. I think overall this is a very effective way to learn about the past because it shows peoples experience of that time and place and not a scientist that just goes off of what he finds and makes theories about. Oral history is in fact the best way to learn about history because you get the raw emotion from the interviewee and what he felt about it over all. Hall Boy The definition of a Hall Boy. Wikipedia, The Free Encyclopedia. Wikipedia® is a registered trademark of the Wikimedia Foundation, Inc.
Mash Hospitals The explanation of a Mash Hospital. Wikipedia, The Free Encyclopedia. Wikipedia® is a registered trademark of the Wikimedia Foundation, Inc.
C-141 An image of a C-141 which he was flown home in.